Here’s a neat little trick. 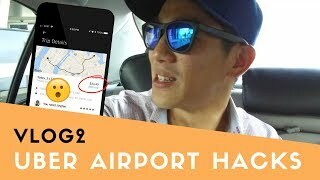 As some of you may know, grabbing an Uber at an airport can either be impossible because of the rules of the airport or the prices are jacked up because of their auto pricing model. If you’re in either of these scenarios, you’re going to want to keep reading because I want to teach you how to save money on your next Uber at the airport. So the hack is actually super easy once you know it. It’s quite ingenious if I must say so myself. Okay I know this one’s pretty obvious but for someone like me that doesn’t have a roaming data plan and travelling to the US, I needed to get on the airport’s wifi first. LaGaurdia (LGA) in New York uses Boingo (which I despise) but does offer 30 minute complimentary access. Do that first! Do what you normally do with Uber which is to open the app and set a destination. You’ll notice that it’ll geo locate you and if it’s accurate, to the airport. At this point, it’ll either present you with prices or it’ll tell you they don’t allow pick ups at the airport. If it lets you, remember the prices that you see here whether it’s Uber Pool, Uber X, or something else. Whether they allow pickups at the airport or not, the next step is to change your pick up location. On the Uber app, use your finger to change the pin location and select somewhere very close by. I recommend either an adjacent hotel or a local neighbourhood street. Let the app calculate the new prices. At this point, compare the prices that it displays to what you saw in Step #2. You should see a difference. Pick what makes sense. In my example with New York’s LaGuardia, Uber X prices were actually cheaper when my pick up point was set to the airport but the Uber Pool prices were much cheaper. I don’t know if I was just lucky but I selected Uber Pool and there was nobody to pick up along the way and the whole ride only cost $24.50. SWEET! Obviously you’re not at the adjacent hotel or the local neighbourhood street so immediately after you get paired with a driver, call him or her. Let the driver know that you’re not at the actual pick up point set on the app and tell them that you’re at the airport. Every airport is different when it comes to dealing with Uber. Some are open and others have strict rules. Your driver will probably let you know whether its possible to do a pick up at the airport. If it’s not allowed, you may need to walk to somewhere else or take a shuttle bus to a different area for pick up. Watch the prices carefully as like I experienced, Uber X was cheaper at the airport so you never know. Hope this hack is helpful to all of you! Leave in the comments below your experiences with this. Did it work? Did you encounter problems? Let me know! !